Jokes aside, I’m not even sure Madison Bumgarner would mind if the designated hitter took over. It doesn’t seem like he particularly enjoys hitting. He doesn’t work on it in the cages or in batting practice and he wasn’t exactly champing at the bit to come off the bench as a pinch-hitter, as one might expect other #PitchersWhoRake would. And it would allow him to put more of his energy into what he actually does enjoy doing: pitching. On its own, a pitcher hitting a home run off Kershaw is noteworthy. Is it postworthy? Maybe. Maybe not. What sends it beyond noteworthy and into postworthy territory is when that pitcher has already homered off Kershaw in the past. A little less than 12 months ago, Bumgarner homered off Kershaw, becoming the first and still only pitcher to do so. Only 17 players have ever taken Kershaw deep more than once, and so now we start having the “ownage” discussion. Does Bumgarner at the plate own Kershaw? He’s got nine total bases against him in 16 plate appearances; Bumgarner’s teammate and actual hitter, Hunter Pence, has five total bases against Kershaw in 59 plate appearances. Bumgarner must just have Kershaw’s number. He’s got a .750 OPS against him, two points higher than Ryan Braun and 12 points lower than Paul Goldschmidt. All other pitchers combine for a .359 OPS in 486 plate appearances against Kershaw. Bumgarner has been better than twice as productive as the average pitcher facing Kershaw. But what does that mean? What do these two home runs tell us? They tell us that Madison Bumgarner is big, and strong, and is capable of hitting a baseball for a home run, even in San Francisco, and they tell us that even Clayton Kershaw can make mistakes. They tell us that pitching is incredibly hard, or hitting is incredibly easy, or something? I guess they tell us that baseball is weird and we’ve really got no idea what’s going on most of the time. They also probably tell us that Kershaw is going to pitch Bumgarner differently in the future, because part of the reason he served up those homers in the first place is because he didn’t view Bumgarner as an actual threat. It was six pitches, and six fastballs, between 92-94. The location for five of the six, was high and outside. It couldn’t be more clear that Kershaw had absolutely zero hesitation in giving Bumgarner anything to hit. He was practically begging the 6-foot-5 righty to extend his arms and put everything he had into a swing. Funny enough, Bumgarner singled up the middle. I’m not sure how the swings look — the MLB.TV archives confoundingly only date back to 2014, now — but I’m going to guess that Bumgarner at least showed something to Kershaw here that told Kershaw he was more than your normal pitching hitter. He was 1-for-1 against him, after all. But that’s not enough. Why would it be? Bumgarner’s still a pitcher. And, like a pitcher trying to hit against the best pitcher in the world, Bumgarner went 0 for his next 11 with seven strikeouts against Kershaw over the span of five years. Through 12 at-bats, Kershaw’d thrown Bumgarner 54 pitches, and 39 of them had been fastballs. Of those, 25 of them had been over the plate. Bumgarner was pitched like a pitcher. Then, in May of last year, Kershaw pitched Bumgarner like a pitcher for the final time. Kershaw put a first-pitch fastball over the plate, like he’d been doing for five years, and Bumgarner crushed it. This is where things changed. It’s one thing to poke a single up the middle. That gave Kershaw an inkling that Bumgarner at the plate might be different. This proved it. You take Kershaw deep, as a pitcher, and you’ve got everyone’s attention. First pitch slider, second pitch curveball, then a fastball to put him away. The at-bat was easy: three pitches, three strikes. But it was much more cautious than we’d seen in the past. Bumgarner wasn’t getting that first-pitch heater down the middle. The fastball rate has been cut in half. Kershaw has actually thrown more breaking stuff than hard stuff since seeing Bumgarner take him deep. Madison Bumgarner has forced Clayton Kershaw to make an adjustment. What is usually a time for Kershaw to catch his breath is now just another at-bat. Kershaw vs. Hunter Pence used to be one of my favorite pitcher vs. batter matchups. I think I have a new one. 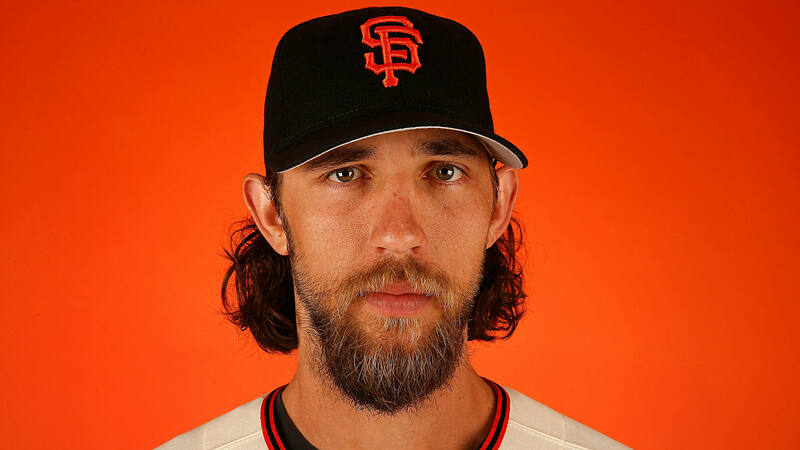 We hoped you liked reading The History of Madison Bumgarner vs. Clayton Kershaw by August Fagerstrom! I think that home run inflicted actual physical pain on Kershaw given the look on his face in the still for the clip.